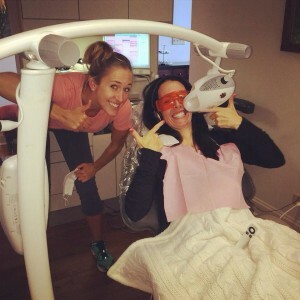 Sugar Fix is the place to go for teeth whitening in Lakeview! We have several teeth whitening options for our patients depending on what they are looking for. For many of our patients, Zoom, KOR or an at home kit all have great results! For this teeth whitening treatment, our patients do a 1-hour in-office visit with Zoom whitening. It is 3 to 4-15 minutes sessions under the zoom laser light. For our patients that are worried about sensitivity, fear not! There are 3 intensities on the light so we can always adjust this if any “zinging” sensations occur. Dr. Emery takes a turn! KOR is a great whitening option, however, it is not the quick fix that Zoom provides. It is an in office and at home treatment that has amazing results. 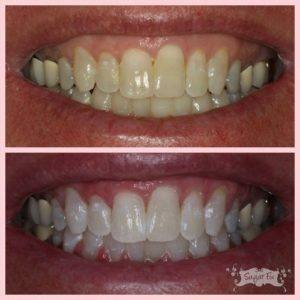 It requires an initial in-office visit and then depending on what type of KOR treatment Dr. Emery recommends, at home whitening in custom fit trays for 2-8 weeks. With this system, you control how often you whiten and get to whiten in the comfort of your own home. Results are achieved usually with 2 weeks and look great! After all whitening procedures, it is important not to intake any staining foods or drinks for 48 hours. For all of these systems, whitening trays are recommended to be used every 6 months after your cleaning to boost your white smile and really make your teeth pop! Call us today to set up a consultation with Dr. Emery to determine what type of whitening options are best for you! We can always do same day whitening for our patients and would love to help you achieve a gorgeous, white smile!